On Sunday, October 1, the Catalan government held a referendum about Catalan independence from Spain in flagrant defiance of the Spanish government. Massive open clashes between Catalan voters and Spanish police took place throughout the region. A general strike is called for October 3 as a showdown looms between rival politicians and, perhaps, rival states. This situation poses complex challenges: how do anarchists show solidarity to partisans of Catalan independence against police repression without legitimizing nationalism, democracy, or a new Catalan state and its police? We spoke with several anarchists throughout the region and translated these three reports to offer insight into how Catalan anarchists are approaching these questions. Read all our reports about Catalonia; here. The Mossos d’Esquadra (Catalan police) announced that the polling locations would be closed or evicted by 6 am Sunday morning. This can be understood as a way to to encourage people to turn out to protect the voting centers. The Guardia Civil and riot police of the Policia Nacional (Spanish police) had been ferried into Catalunya on cruise ships and accommodated at hotels. They began evicting voting centers early in the morning, inflicting at least 844 documented injuries across Catalunya. Over a hundred people were hospitalized, some in serious condition. The actual number of injuries may be considerably higher. In one instance, an old man had a heart attack after a police charge; police attacked again as people were trying to revive him (Warning: Facebook link). Image: Farmers blocked the streets from the Port of Barcelona to prevent more Spanish Guardia Civil from exiting their cruise ships. 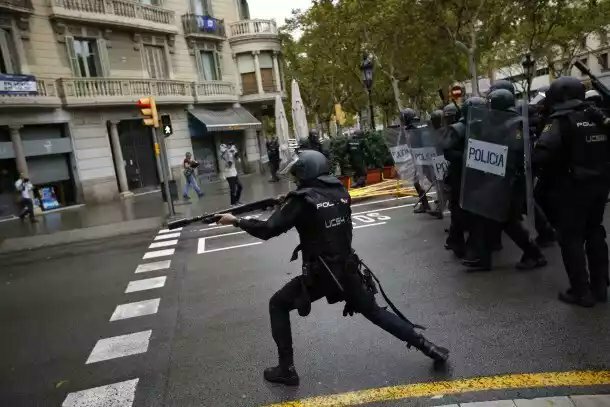 Yesterday, October 1, the referendum for Catalan independence took place in the middle of an enormous police operation. The government in Madrid threatened to close the places where voting was going to take place; in order to prevent that, people occupied those spaces two days ahead of time, including half of the high schools in all of Catalunya. In some towns, people even took off the doors so that they could not be closed to lock out potential voters. People came together starting at 6 am to protect the ballot boxes, while police showed up outside at many polling stations to remove them. The watchword of the day was to defend the ballot boxes nonviolently and within this framework were seen many diverse shows of spontaneity: tractors blocking roads, people running and organizing themselves to make sure that all of the points where police could go were covered. In some towns, the police were stopped with barricades. One highlight for me is that in the town of Sant Carles de la Rapita, the Guardia Civil were forced back with a hail of stones. In thousands of towns, people opposed the police. It’s difficult to know how far self-organization reached, although in the big cities, most people drank the Kool-Aid of nonviolence and let themselves be beaten. This created some surreal situations: police beating people who wanted to vote and confiscating ballot boxes in order to “defend democracy,” firefighters forming security cordons to protect voters from police, confrontations between Spanish and Catalan police. All this generated sympathy from the people towards the Catalan police (who are known for being real motherfuckers), to such an extent that people applauded when they saw the Catalan police vans pass by. It was Kafkaesque. At the end of the day, President Rajoy was pleased with the actions of the police and affirmed that in Catalonia “there had been no referendum.” On the other side, Puigdemont, the Catalan President, said that Catalonia would apply the referendum law according to which they must proclaim the new Catalan Republic in the days following the referendum, and appealed to European and international heads of state to mediate the process. Image: Catalan firefighters showed up to act as a barrier between the Guardia Civil and those trying to access polling places. Video: Spanish police beating Catalan firefighters. There is no single anarchist position on all of this. All anarchists reject institutional politics, bourgeois nationalism, and class collaboration, and we will never applaud the Catalan police. At times, the situation is not inviting to anarchist participation. Even so, there are many who affirm that where they live, they find themselves on the side of those who decided to take the streets. What anarchist can stay indoors while police threaten and beat people who desire to have more of a say in their lives? It is tempting to want to break up the Spanish state or, if not to destroy it, at least to debilitate it through a popular struggle. And when people are in the streets, this presents the possibility that things might overflow, exceeding their limits… although at the moment, this is difficult, since it is politicians who hold the initiative. Anarchist and antiauthoritarian organizations and unions and independent unions have called for a general strike on October 3. Yesterday, at the eleventh hour, the CCOO and the UGT (the “fire-extinguishing” unions that re-absorb and domesticate popular struggles) and the ANC along with the Omnium Cultural (the organizations that articulate bourgeois nationalism in its purest form) joined the call for the general strike. Visca la terra lliure de patriotismes! Here’s to an earth free of patriotism! Image: Guardia Civil raided over 300 of the 2300 polling places around Catalonia. I’m writing this to you just after getting out of an assembly because tomorrow there will be a general strike in Catalunya. Actually, they don’t consider it a strike, more like a work stoppage. From the neighborhoods, people are organizing piquetes [blockades] and some demonstrations. These have been tireless days, filled to the top. I’m guessing you have seen the images of the day’s events on October 1, which were really, really crazy. Anarchists have showed up late and ill-prepared for the independence process. For five years, the proposal for independence has been gestating, from both the Generalitat (the Catalan government) and leftist, independentist Catalan political parties like the CUP, which came out of the independentist leftist after the 15M movement. Anarchist and anti-authoritarian movements haven’t really kept up with the independence movement. So this whole thing has caught us almost by surprise, which doesn’t put us in a good light, considering that it’s been going on for five years. Often, we live in our own bubble while the world changes and forces build without us realizing it. Starting some months ago, various neighbors, including some who belong to the (independentista) National Assembly, others to the CUP party, and other people who are closer to the independentista movement all started to organize themselves into committees in defense of the referendum. Spanish censorship was ramping up ahead of the vote, and the state was taking measures to control what appeared on the internet, especially in the moments right before the referendum. Through these neighborhood defense committees, people organized assemblies that are not controlled by the (indepedentista) National Assembly, nor by the Catalan government, which is the driving force behind the referendum. There have been confrontations between representatives from the National Assembly, the government, and the neighborhood assemblies because the assemblies questioned decisions that representatives from the National Assembly told them not to question. In the days leading up to the referendum on October 1, there was a lot of nervousness on the part of the National Assembly, because there were many parts of the independentista movement that they couldn’t really control. In the end, the neighborhood assemblies were responsible for much of the logistics of what happened on voting day, determining how people organized themselves and how they defended the polling stations. Image: The violence of the Spanish police. Anarchists hadn’t thought about what to do in relation to this movement until the referendum was approaching and the Spanish state began to crack down on civil liberties. Faced with the censorship imposed by the state, a large number of anarchist groups from different parts of Barcelona, who have already been organized in their own neighborhood assemblies and social centers, decided to give support to the local independentista movements. Within the anarchist movement, there are people who support the referendum itself, and also people who don’t. Independentist people are demanding basic democratic rights and civil liberties, such as the right to vote, and some anarchists believe that anarchists should be out there with them. There are also people involved in the independence movement who we lost track of years ago when the political parties like Podemos and CUP that cropped up after the 15M movement in 2011 institutionalized the energy from the streets. Now, with the referendum, people are returning to the streets, so we decided it was an important moment for us to be out there too. But this has created a good deal of debate within and between anrchist collectives, because we are definitely not coming from the same place politically as many of the independentistas. For us, it has been really complicated. For me personally, sure, I hold contradictory positions all the time, like supporting certain reformist campaigns or engaging with single issue movements… but to defend a democratic process towards national dependence… it’s very hard to figure out where I stand. Many of the comrades in our neighborhood are trying to figure it out too. We have been organizing ourselves and coordinating with independentista groups that have been active in the neighborhood. We attended some assemblies and announced that on the day of the referendum, we would open up our social center as an info-point with food and outlets for charging cellphones, a place where you could rest up and get hydrated. This was also a way of suggesting to people who believed in self-determination, albeit through statist means, that there are other ways to take direct control over our lives, in these spaces at the margins of society. So yes, we decided to lend our support. Yesterday was the day of the vote, and there was no other topic either on the news or in discussions on the street. It was the only subject of conversation. On the street where I live, there were two polling stations. Starting at 5 am, we went out onto the street and erected barricades. Catalan police came to tell us we weren’t allowed to do that. Then we marched, and from 6 am the whole voting thing commenced. There were so many people out. Honestly, it was difficult not to get swept up in what was happening—lots of elderly people, lots of excited people. On one hand, it was really exciting; on the other hand, it was totally ridiculous because the people who had come out to vote were raising their fists as if they were political prisoners—here in Barcelona, there is a kind of folklore about rebellion. The independentista voters were acting like they were doing the most clandestine, badass thing in the world. I’m sure everyone has already seen the scenes of violence showing the Policia Nacional and the Guardia Civil in high schools in Barcelona and other towns around Catalunya. We heard that the Policia Nacional were deployed close to where we were. Things intensified from there and that lasted the whole day. More than 50% of the anarchist groups in Barcelona have voted. I voted for a friend who wasn’t able to. The truth is it was difficult not let yourself get carried away by the moment. Many of us went home yesterday very annoyed, because we had a lot of differences with what was happening. About two weeks ago, the anarchist collective here in my neighborhood had a discussion about whether or not to defend the process of national “self-determination.” There were many people close to us, with whom we share a lot of political affinity, who said it was better to struggle against the institutions of a Catalan state because it would be a smaller state. Many people also supported the process in hopes of destabilizing the Spanish state, because at the moment the Spanish state is very weakened. It’s a moment that could tip either way. Personally, I don’t like either of the options. We can’t lose track of where we stand as anarchists. I think we should be supporting people in the streets, but I truly believe the worst thing that could happen to us would be if a Catalan state gained independence. In the end, it’s just a way to legitimize the social and political exclusions that exist today to believe that we’d have more control over them in a smaller state. But it’s hard for people to see a Catalan state as something other than their own, especially after struggling for years to achieve it. While people went out to vote impassioned to the point of tears, several police murders have taken place in Barcelona in the last several months without any response. Meanwhile, thanks to the referendum process, the Mossos d’Esquadra have gotten a PR makeover as the good guys; until this, they always received negative press coverage. The Policia Nacional (Spanish police) have practically tortured people, leaving many with visible injuries. On the good side, they’ve turned public opinion against them. So the militarized Policia Nacional now look very dirty, and the Mossos de Escuadra seem more “clean”—although their current “clean” image just means they will be able to utilize this legitimacy to employ violence with fewer obstacles. I believe we have to acknowledge the disobedience of the Catalan people, their confrontation with the police, and the resistance that they’ve demonstrated. It has been incredible. Like I’ve mentioned, the anarchist movement has arrived late and ill-prepared to a process that has been gestating for five years already. We can’t expect to do the work of years in just a couple weeks. Carving out our own space is difficult and we have to take a humble approach to it. Image: The people of Catalunya against the police of Spain. Video: Spanish nationalists and fascists sending off the Guardia Civil on their trip to Catalunya. The point isn’t to help build a new state, but rather to demonstrate through practice that self-organization, networks of mutual aid, and assemblies are the real alternative to the Spanish state, and through this we find each other, some of us being anarchists, but many others too. What is clear is that the struggle against statist hierarchies is not on its way out: it simply continues in a different context. If a Catalan state comes to exist, we will maintain our opposition to the state from the very same networks with our own practices, our own communities, our own economies of mutual aid. My enemy continues to be capitalism, the military, the clergy, the farcical politicians and bankers. Anarchists don’t stop being anarchists just because they express solidarity with people facing retaliation from the state. I know perfectly well what happened in 19371 and that we must not abandon our memory of the previous times we were betrayed by statists, but we also must oppose current state repression—or else will we simply stay put, watching? Our struggle is to be present in the streets to offer our vision and denounce the violence of the state, whether it be Spanish, Catalan, or Chinese! We must learn about what happened in the past, when anarchists were betrayed. We should try to make sure it doesn’t happen again, which is to say, we should foment a consensus among anarchists and anti-authoritarians for when this situation is over, when we will continue building self-organization. I, at least, for many years now, have been working for this 24/7, and whatever happens I will continue doing it as I’ve done every day. Anarchism is not a dogma, neither is it a religion. It is a form of life, a way of feeling and acting as a human in harmony with the earth. Every era has its context, and it’s true that those who believe in the state have betrayed us before, but we forget that without us, they won’t change either! We will continue influencing society, despite ourselves. The Anarcho-Independentista current is criticized by comrades who are more “orthodox” or dogmatic, depending on how you see them. There are some who support the idea of independence without a state. It’s not a majoritarian position, but I consider it a valid one. For a long time, anarchists have not focused attention on the subject of independence. Now this issue has served to inspire debate and discussion; we disagree with each other, but we try to come to some consensus. I don’t know if we ought to vote or not, but I do know that the Spanish government is getting more fascist by the day. It’s not that it surprises me, in any case I am against a government that approves the slogan “better bloody than broken,” referring to the Iberian peninsula and so-called Spain, which already indicates how old this subject is—something that has been going on for centuries. The CGT has called for a general strike in Catalonia which will be supported by the CNT-AIT, the historic organization that nowadays is much smaller than the CGT, an anarcho-syndicalist union that is more “open” and participates in union elections, with over 25,000 members in Catalunya. The CNT-AIT, sadly, does not represent even a 25th of this amount. The other CNT has a very hard split with the Independentistas and is against anarco-independentistas. The Cooperativa Integral Catalana, despite not being a specifically libertarian (i.e., anti-authoritarian) organization, has many members who are activists. Their structure is horizontal, based in non-hierarchical assemblies, and they make decisions by consensus. It’s dedicated to building self-organized economic networks and to protecting small non-hierarchical projects in Catalunya. They are supporting the strike. Oca Negra and Proces Embat are anarco-independentista organizations that organize with the CGT in some aspects of the struggle. The Federació Anarquista de Catalunya is another relatively new organization with a position in favor of celebration of the referendum. 1O: El Poble i les Seves Gàbies: an anarchist analysis in Catalan, speculatively exploring possible scenarios in the independence referendum, that appeared on September 20. Here we refer to the situation created by the ERC (Republican Left of Catalonia), the Catalan State, and the PSU (Communist Party) in 1937 in the middle of open revolution and civil war. They were determined to annihilate anarchists and wipe out their important contributions to the collectivization of farms and workplaces and to the struggle against the fascist reaction led by Franco. They forcibly integrated anarchist militias into the state military. There were fierce confrontations between the Stalinists and the anarchist CNT-FAI, who had the support of non-authoritarian communists of the POUM. This produced numerous armed confrontations between both sides. Let’s just say that many comrades remember this and don’t want to have anything to do with the contemporary ERC, even less with the Catalan Democratic Party (PD Cat), nor with the CUP, although this last party seems to harbor certain libertarian tendencies in its ranks. We did. Directly under the first image. We always put it there so our readers see it at the beginning.